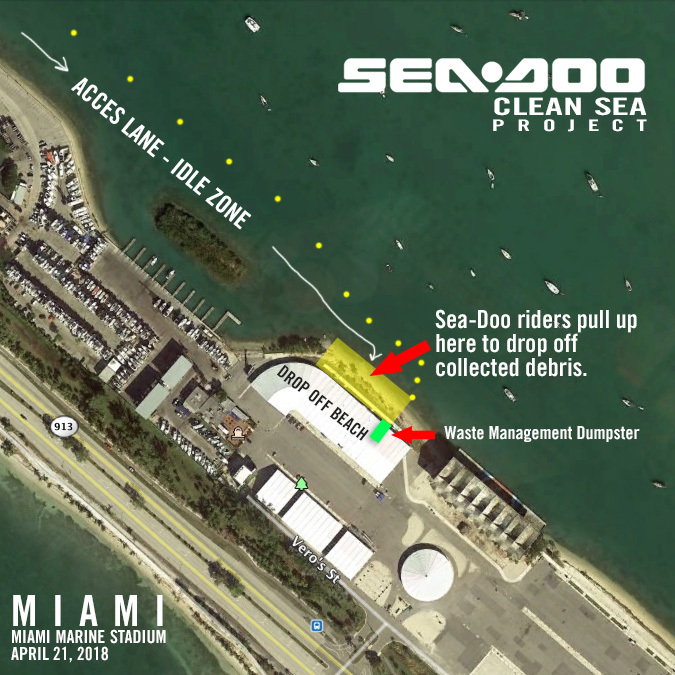 On Saturday the 21st of April 2018, BRP, makers of Sea-Doo watercraft, will celebrate and support Earth Day weekend with the launch of the Sea-Doo Clean Sea project – a shoreline/island clean-up effort in two Florida locations; Miami Marine Stadium in Miami and Maximo Park in St. Petersburg. 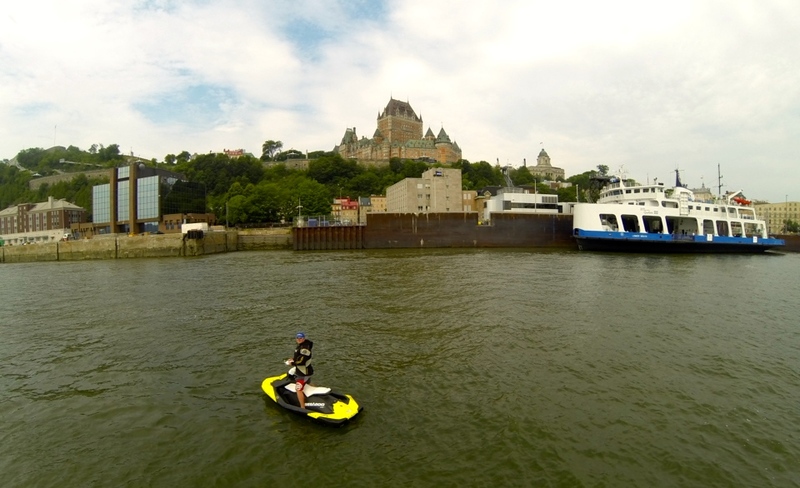 This clean-up effort is to help keep waterways trash-free so that all can enjoy the beauty of nature, will be powered by volunteers from various personal watercraft (PWC) clubs from the local areas and sponsored by Sea-Doo. At 9 AM ET, on the Saturday of Earth Day weekend, a fleet of PWC owners will gather and then ride out to designated areas to pick up trash and debris from beaches and shorelines. All collected garbage will taken to a dedicated drop off location to be picked up for disposal by Waste Management. A deliciously wholesome and earth-friendly lunch will be provided to all volunteers after the clean-up. As Sea-Doo celebrates its 50th anniversary of continual environmentally responsible innovation, BRP embraces the opportunity to start an environmental responsibility movement. BRP envisions that the Clean Sea project will become an annual event that will eventually expand from a local Florida program to a worldwide initiative, one that will continue through the next 50 years and beyond. DATE AND TIME: Saturday, 21 April 2018, 9AM start time with 12/1PM ET trash drop-off window. TAMPA/ST. PETERSBURG MEET UP AND DEBRIS DROP OFF LOCATION: – Trash bags, Gloves, and Event Hat will be provided to first 100 PWC volunteers. Pinellas Point Dr. South & Sunshine Skyway Ln S.
MIAMI MEET UP LOCATIONS: – Trash bags, Gloves, and Event Hat will be provided to first 100 PWC volunteers. Miami Marine Stadium – slightly west of historic grandstands. 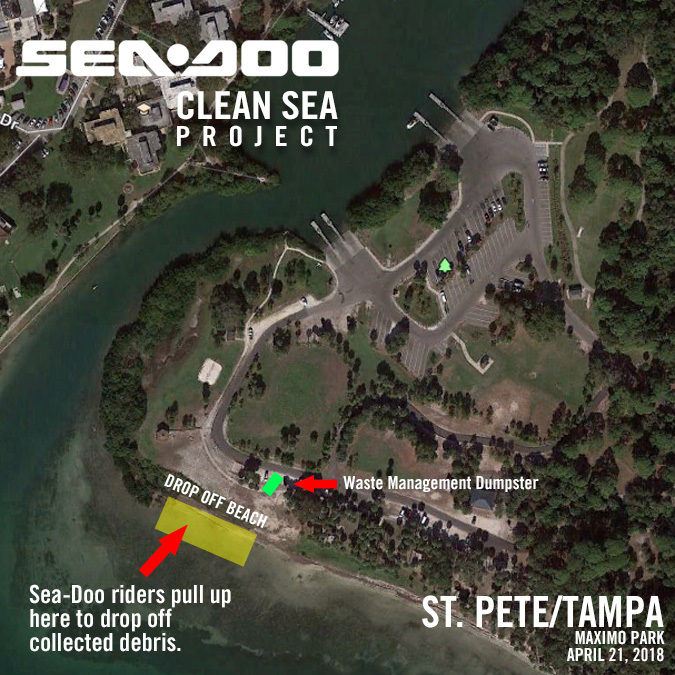 Sea-Doo will be organizing the effort and working with local PWC clubs, providing the first 105 volunteers with heavy duty trash bags, gloves, and a commemorative Sea-Doo Clean Sea Project cap during the clean up and select drop off location volunteers event shirts. 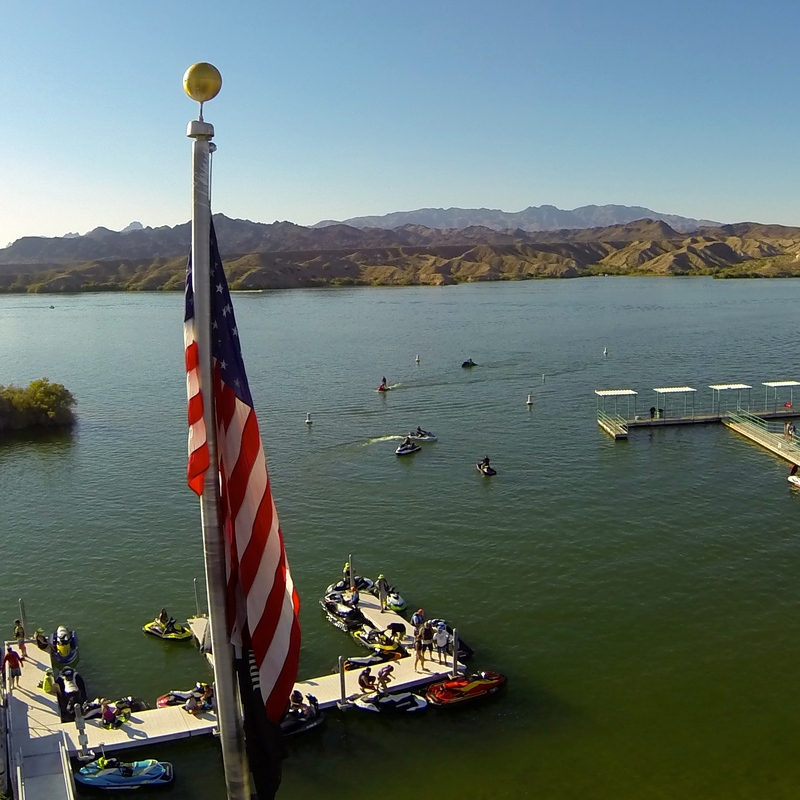 Lunch for volunteers will be provided by Sea-Doo and begins at 12PM ET. The PWC Clubs and on-line communities include: Jet Junkies, South Florida Riders, Tampa PWC Club, and the Florida Jet Riders. 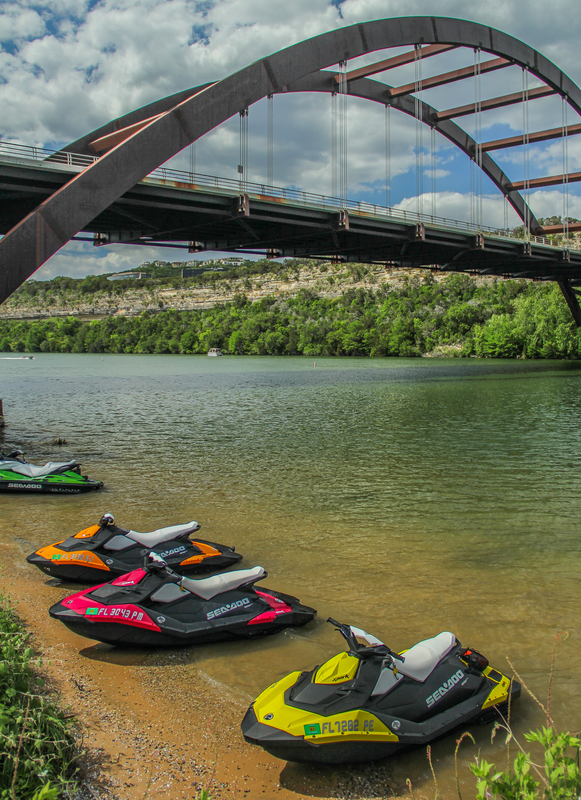 The Sea-Doo Clean Sea Project is part of BRP’s many environmentally responsible initiatives and is looking to involve the Personal Watercraft community to start a Clean Sea Movement as the brand starts their next 50 years. Our time is valuable and limited and our free time is more of a premium. 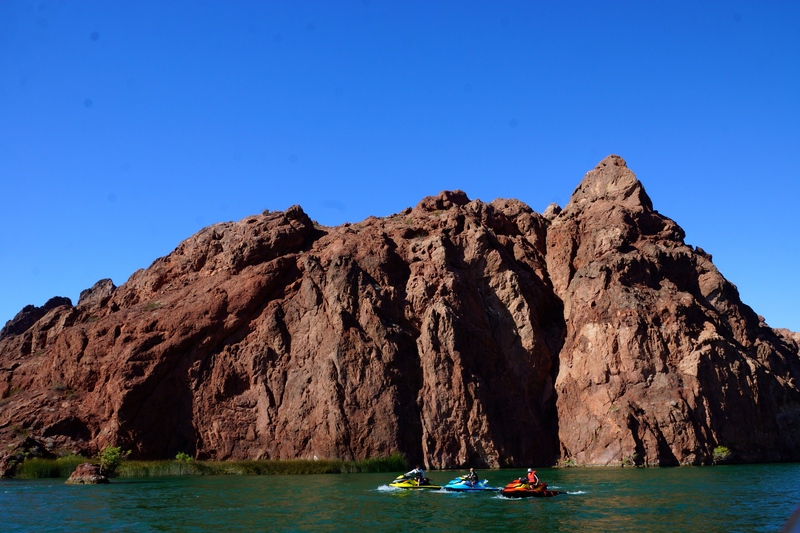 When we look to spend a fun filled day on the water we want to get the most out of it. We want to make every minute count. The challenge is how do we live the most minutes living the Sea-Doo life? The sun is only up for so long in a day. To make the most of your day on a Sea-Doo watercraft some try to ride from sunrise to sunset, but how many actually accomplish that? This is a day you are guaranteed to make the most of. Let’s take this a step farther. Let’s make it more interesting. What if you watched the sun come up over the horizon of the water and said, “Go” to your group of ride friends and rode all day racing the sun to sunset and watched the big ball of light sink into another horizon of the water? This was the concept behind the latest Sea-Doo video challenge Racing the Sun. One of the more interesting navigational treks in North America is the Okeechobee waterway that cuts through the lower half of Florida. This waterway offers a short cut for both pleasure and small commercial vessels bypassing a long trip around the southern peninsula and to make passage from Florida’s East coast at the city of Stuart, to the peninsula’s West coast at Fort Myers Beach. This waterway is a manmade passage managed by the Army Corp of Engineers and stretches more than 160 miles from east coast to west coast with the 30-mile wide Lake Okeechobee providing the open water middle point. Most of the waterway consists of dredged canals measuring 100-150 meters wide and includes five locks, to control the water levels of the Okeechobee, which helps provide irrigation for millions of acres of sugarcane and citrus crops. The sights along the way are interesting to say the least as hundreds of species of wildlife can be seen as well as domesticated horses and cattle sipping at the water’s edge. An equally diverse array of vessels and people can be encountered during a trip on the waterway. 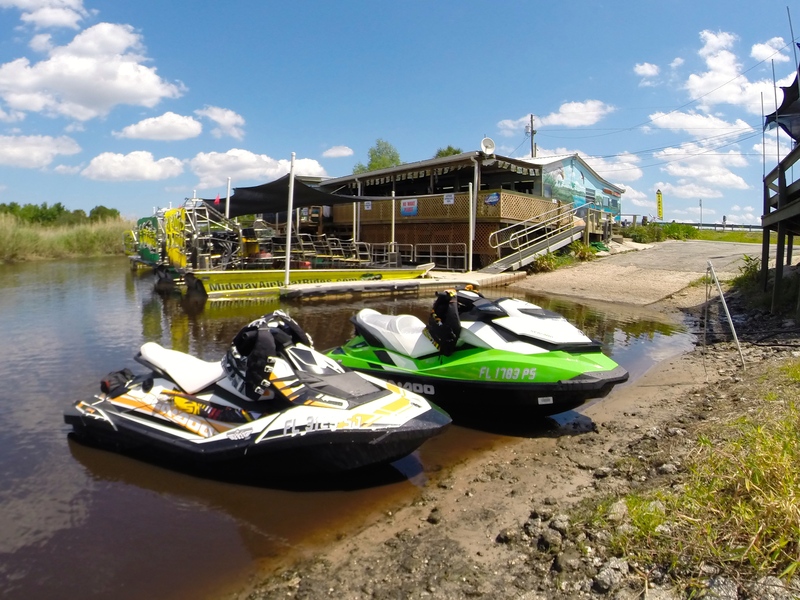 The ride lends itself to an incredible Sea-Doo experience as the protected waters make it a trip nearly any Sea-Doo watercraft owner can do. We challenged some accomplished riders to make the trek and videoed the adventure. 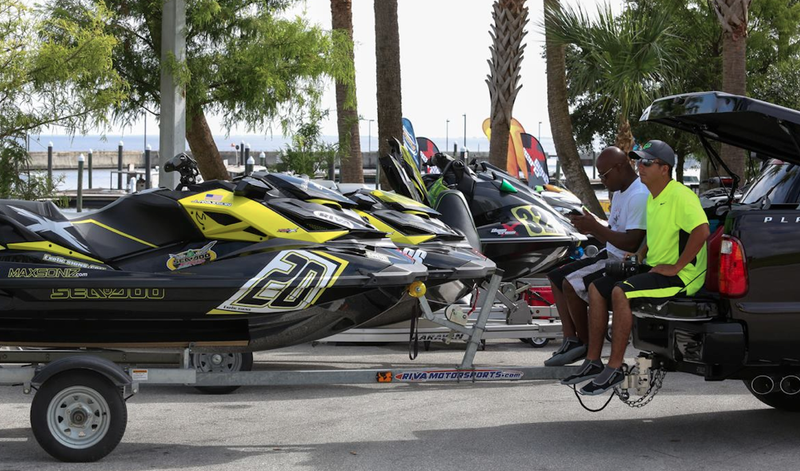 To ensure the odds of completing the challenge were in our favor, all three rode new 2016 300 horsepower Sea-Doo watercraft models including X-TEAM racer Erminio Iantosca (@erminioiantosca) on a RXP-X 300, Cody Hawkins (@codyhawkins) on a RXT-X 300 and Ashley Sponaugle (@ashleysponaugle) on a GTX Limited 300. The project had to be shot in one day as thee are no retakes with a sunrise and sunset. This was a challenging project and very aggressive planning to capture such a ride on video and tell the full story. The crew was minimal to say the least. The crew consisted of three riders, one boat driver, one cameraman and two truck drivers to chase along with the trailers, plus two Facebook fans in Ft. Myers we would meet up with at sunset. Planned a month in advance, weather was a major concern and when the day came we were gifted with near perfect weather, a tad windy, but no rain and mostly sunny skies. The day of the crew woke up at 4:30 and launched the units prior to sunrise to get over to the south end of Hutchinson Island and the Stuart Inlet. Exactly 6:13am the sun broke the horizon and the clock started. Thee riders aboard three 300 horsepower watercraft set for a 14-plus hour trek. We knew we would encounter many slow speed zones and waiting at locks and this was built into the plan. What wasn’t built into the plan was the photoboat’s steering fading away at about the 20-mile mark. With 85% of the trip in front of us, right around the point where we pass several cows next to the waterway, the steering gear box faltered and we had virtually no steering to the left. With veteran adventure boaters the team continued using what little steering they had and using so leaning along the way. Luckily the wind was from the rear and the there were little sharp turns involved in the journey allowing the chase/photoboat to keep up with the 300 hp watercraft. 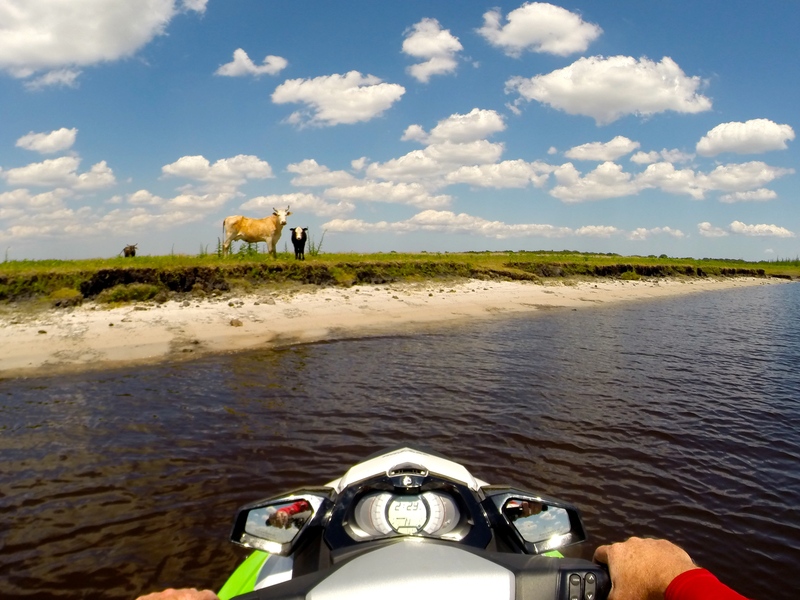 The three new Sea-Doo models ran flawlessly and covered plenty of distance and other than the diverse scenery along the way the only drama was keeping the boat on course. 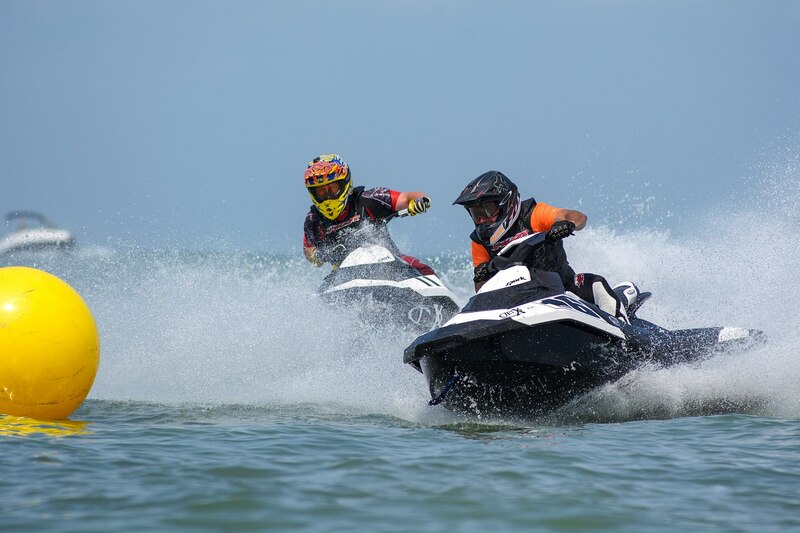 The adventure was just that as our riders successfully made it to Sanibel Island where they met up with local Facebook fans Julio Paulo who owns a SPARK model and Raegan Wesch a proud owner of a Sea-Doo GTX 155. 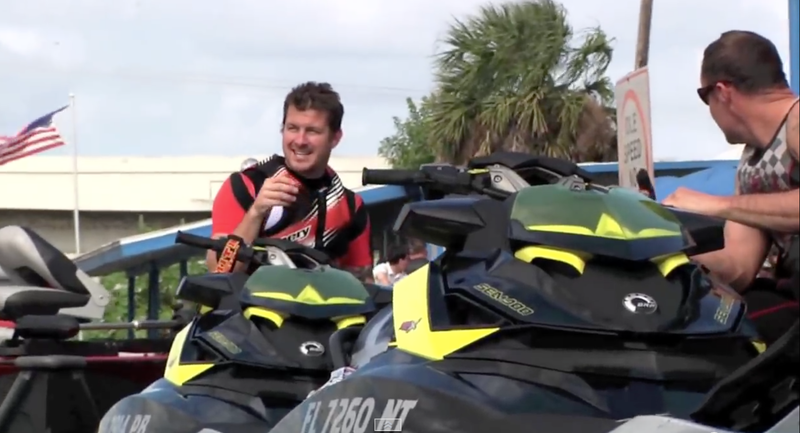 Over three hours of video was captured over the nearly 15-hour journey and it was all cut into a 2:00 video that you may have seen on the Sea-Doo Facebook, Twitter, or YouTube channels. We also produced a longer version that shows a little more of the adventure and some of the elements that make the Sea-Doo life the most fun you can have on the water. Enjoy and have a great summer. When championship Sea-Doo racer Eric Lagopoulos isn’t in hot pursuit of his next win and triumphant appearance on the winner’s podium, you can find him living the Sea-Doo life on the west coast of Florida where he spends his days running his popular waterfront restaurant “The WaterfrontToo” and enjoying his Sea-Doo in a more relaxed and leisurely fashion. Onboard: Your fans know you well from your multiple wins and your racing fame including your most recent trip to the winner’s podium at the 2015 AquaX, but what would surprise them to learn about you? Eric: At a young age I had the opportunity to get involved in the family restaurant business and I jumped on it! Today, I now own “The WaterfrontToo” Grille & Steakhouse, a spin-off of the original “Waterfront” restaurant my family established in Sarasota. It’s a 250-seat seafood and steakhouse in Nokomis. I’m proud of what we have accomplished, especially being recognized for our signature hand-cut steaks and fresh fish as well as for our slow-cooked prime rib which is the best in town! We also cater to water enthusiasts – they can access the restaurant by water and pull up and dock for an evening of dining fun waterside. Onboard: When not in the heat of racing season, what’s a typical day for you like? Eric: My typical day would be to wake-up and either work-out or go riding. I try to ride three to five days a week to stay in shape for the grueling Aqua Cross season – which is fast approaching! After prepping for competition on my Sea-Doo – so I can continue to win titles, I then head over to the restaurant. Since it is only open for dinner, it provides me with tremendous schedule flexibility. This allows me to fit my race training schedule around owning and operating my restaurant. 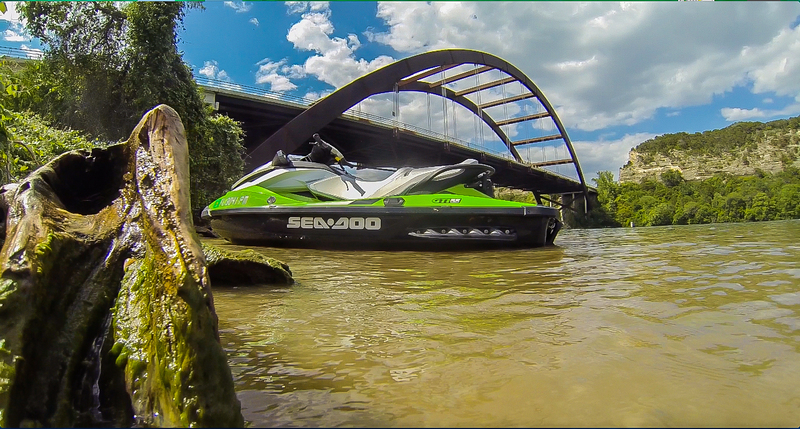 Onboard: Your Sea-Doo is a major component of your life on and off the race circuit. How do you like to spend your “off” days? Eric: My perfect “non-racing” day on my Sea-Doo would be going to a place I’ve ridden to my entire life, a place called Bayside. It’s on the northern end of Longboat Key, and it is one of my favorite spots because it makes for easy access to the Gulf of Mexico. On a perfect day, there would be three to five-foot surf – which offers me and my buddies awesome launches all day long! And when not on my Sea-Doo, you can find me enjoying other water sports including wake boarding and surfing. Onboard: Thank you for taking us through a day in your Sea-Doo life, now circling back to racing – can you share with us what’s new for the 361 team in 2016? Eric: The 361 team will have a cool new title sponsor for 2016, Von Vape! I’m really excited to partner with this company, they are local and have a long history of boat racing in the family! 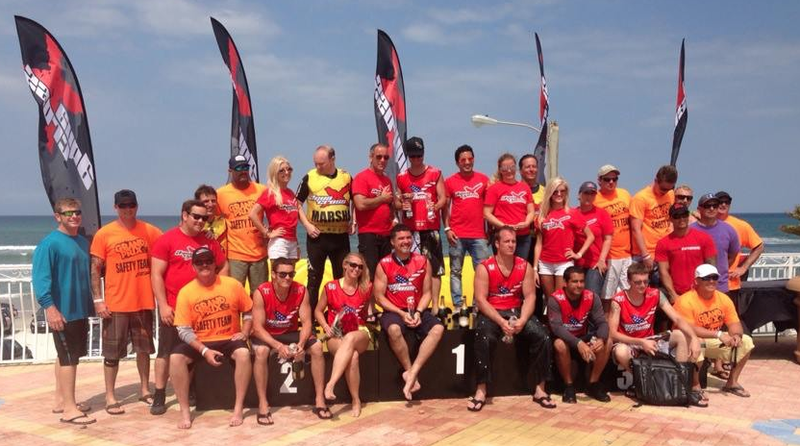 Von Vape will be joined by Sea-Doo, Riva, Hydroturf, Fly, and Jetpilot in keeping me on top of the podium! 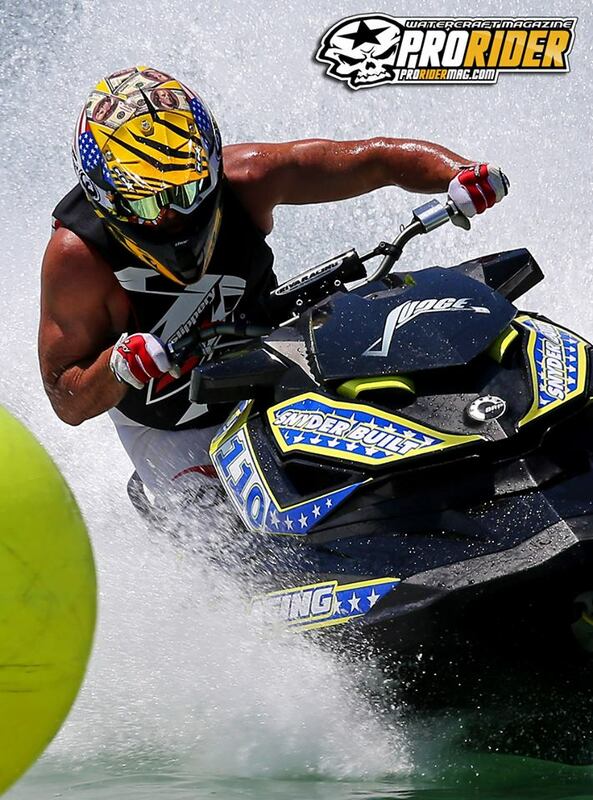 athlete, CWA Watercross tour, Florida, high performance watercraft, monster, paul green, personal watercraft, pwc, race craft, racing, runabout, Sea-Doo, Spark, title, wake surfing, watersports, x-team. Where did you grow up and how was your competitive spirit developed? What do you do away from the water to stay on the water? What’s your profession? Paul – I currently own a private investigation business in Toronto, and I’m a Certified Fraud Examiner CFE. Being self – employed and having a flexible work schedule, allows me to travel and pursue my racing career. The experience I’ve gained through running my own business, has helped me manage my racing career. How were you introduced to watersports? Paul – My first introduction into watersports was waterskiing at our cottage as a child. That would lead to working as a lifeguard and later teaching competitive swimming to youths. My first PWC was a Wet Jet 432 that handled like a tank! Since you began competing what are some of your accolades? Paul – My first season competing on a runabout was 2014. I raced the CWA Watercross Tour in the newly formed Runabout Rec Lights Class. I was dominant in the class and won the overall title. I also won the Master Ski Stock overall title. 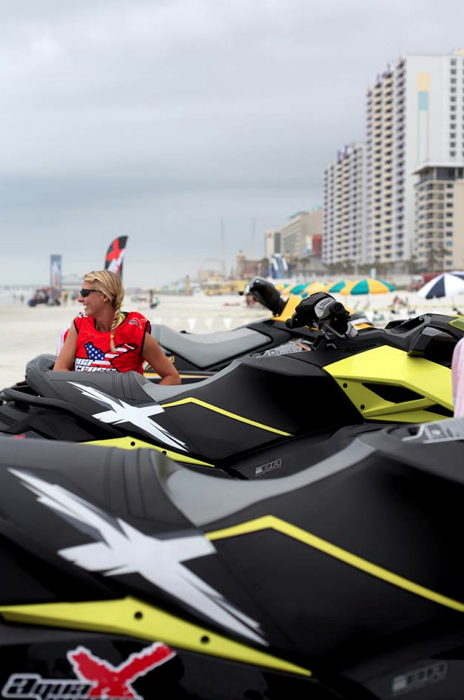 What is it about the Sea-Doo SPARK that enticed you to race this new model? Paul – Initially, I purchased the SPARK as a fun boat for the weekends. After spending sometime on the boat, I realized the boats potential as a viable race craft. I began working on the machine and started promoting it within the watercraft community. Not long after, SPARKs began showing up at the races and a new class was born. What kind of support team do you have behind you and what does it entail? 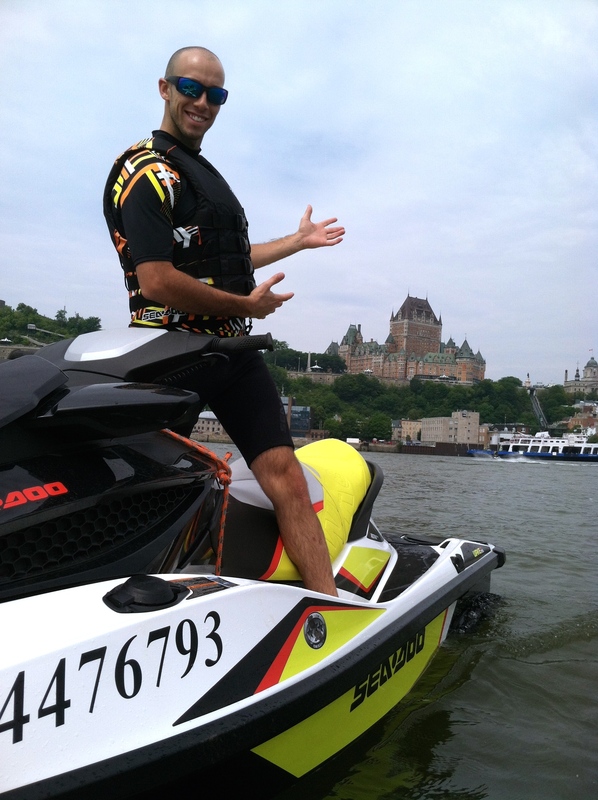 Paul – I am lucky to have Riva Racing, Sea-Doo X-TEAM, and Solas as sponsors. I have been testing with Riva and assisting them in developing new performance products for the SPARK. 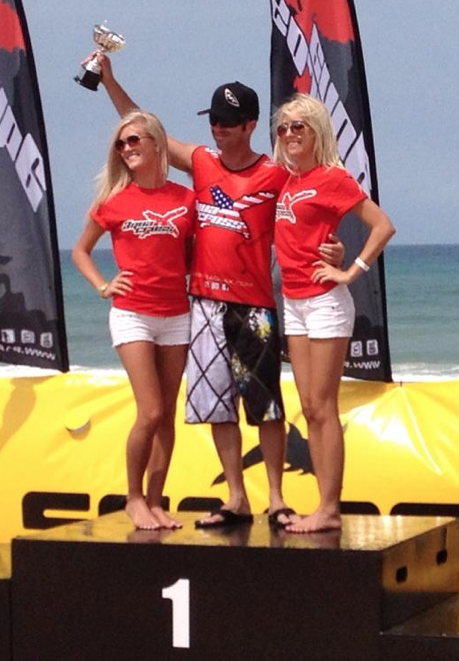 My girlfriend, Rachel Thomas, has also been instrumental in my success on and off the water. No one wins titles by themselves. Your accomplishments riding watercraft have opened the doors for other action opportunities. What “extra” perks have you enjoyed from being a pro racer? Paul – I have traveled extensively with the sport and have enjoyed the experience greatly. This past summer, I had the opportunity to take up wake surfing thanks to my family which is a blast. I also try to attend as many Monster Energy Supercross races as I can each season. Getting the recognition as an X-Team member is a thrill. 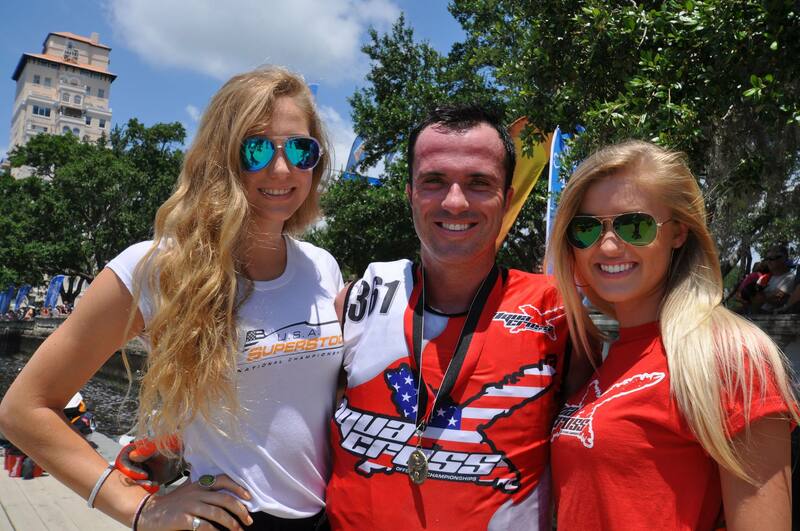 Where is your favorite PWC race site? Paul – I enjoy the Ocean race sites, particularly the Florida stops with the warm water and ever changing surf. Racing surf forces the rider to use all their skills in order to be successful. The Ocean levels out the playing field. What is it about PWC racing that keeps you coming back? Paul – I started racing PWC’s in the late 80’s and have enjoyed competing both as a privateer and as a factory backed rider in the 90’s. The thing that keeps me coming back to the sport is the constant innovations to the watercraft. I find the technology fuels my passion and I’m constantly being forced to learn new things. The clean burning 4 strokes of today are superior to the 2 stroke technologies of yesterday. Where is your favorite non-racing, riding location? Paul – I really enjoy riding in South Florida and the Florida Keys. The natural beauty of the area can’t be beat. Surf riding at the Sebastian Inlet in Florida is always eventful too! Watching Dolphins and Sharks share the water as you ride is an awesome sight to see. Paul – My favorite part of being on the Sea-Doo X-Team is being part of a professional group of racers who have similar focus and goals. The comradery and friendships formed are the best part of the team. The opportunity to showcase my riding skills with other high level athletes is great. What are you racing right now and what are looking forward to, and who is supporting your 2015 efforts? 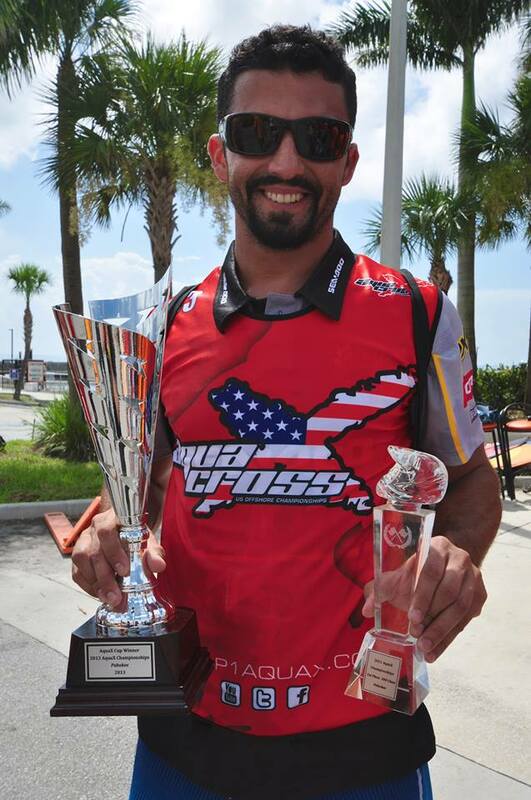 Paul – I plan to ride a 2015 Sea-Doo SPARK and defend my CWA title in the Runabout Rec Lights class. 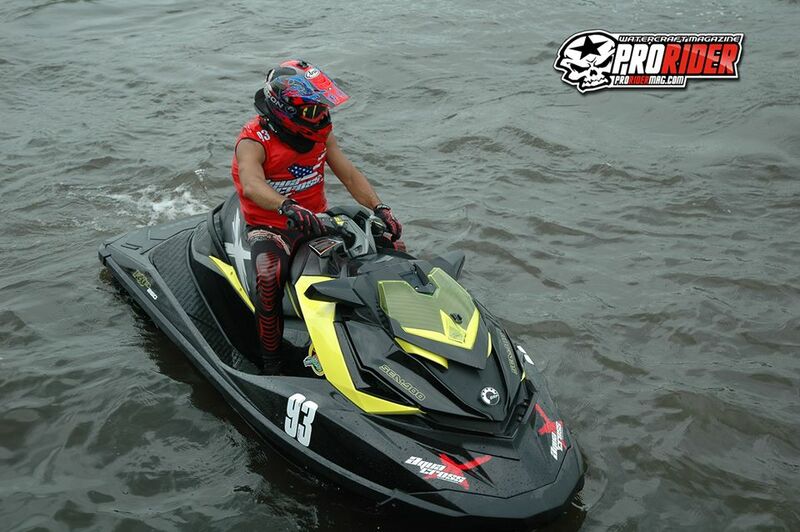 I’m also exploring the possibility of racing a Sea-Doo RXP-X in the Pro Am Runabout Stock class. Riva Racing, Sea-Doo and Solas will be my key sponsors for 2015. 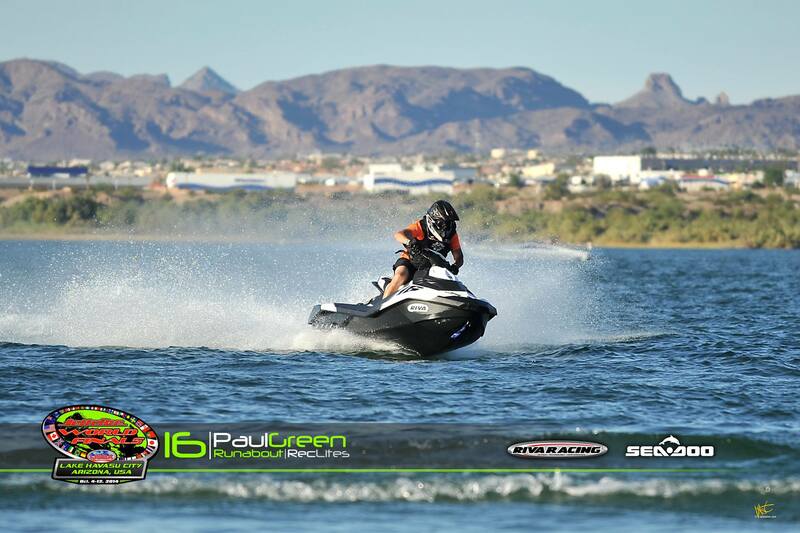 I’m looking forward to continued success in 2015 aboard Sea-Doo watercraft! 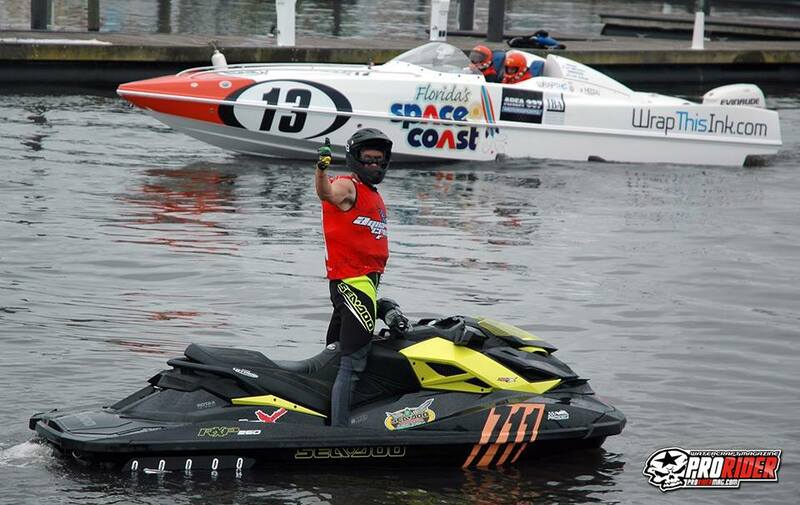 Eric Lagopoulos continued his 2014 unbeaten streak in the AQUAX 250 class by sweeping all three mottos on his Sea-Doo GTR 215 taking his season total to six consecutive moto wins. Lagopoulos was joined on the podium by fellow GTR 215 mounted racers Sean Hagan taking second and Tim McKercher rounding out the top three. 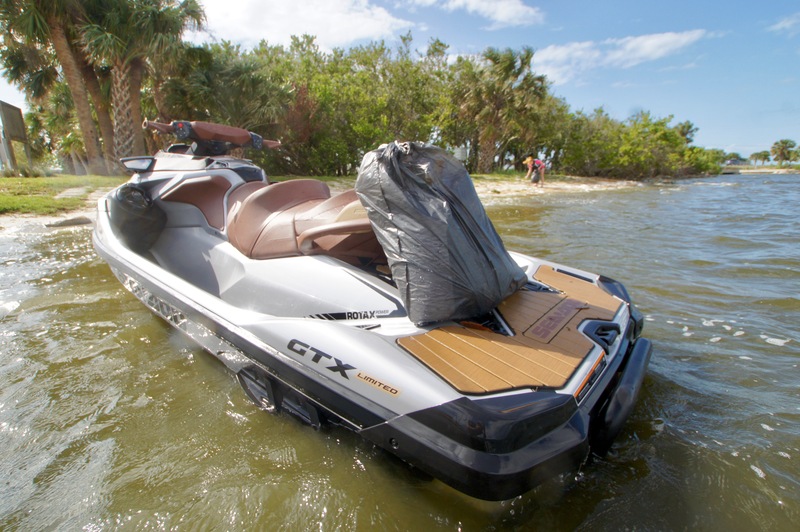 The Sea-Doo GTR 215 is arguably the watercraft industry’s best keep performance secret as BRP‘s lowest price performance model that is fast with predictable handling yet very forgiving in unpredictable conditions. 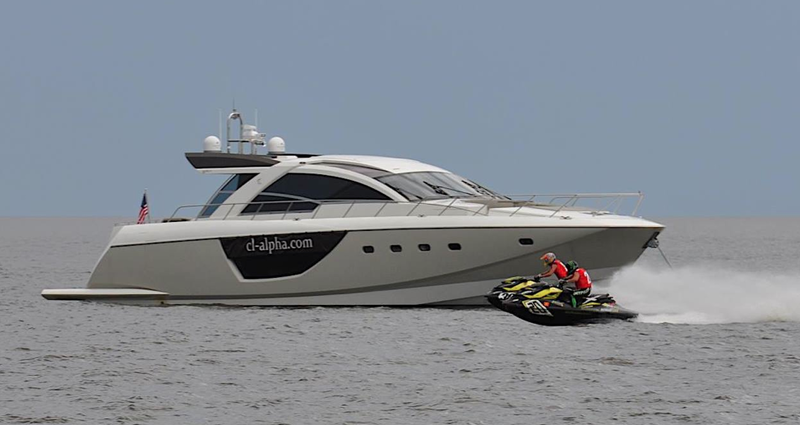 The GTR 215 model is proving itself as the ultimate mid-range performance watercraft. 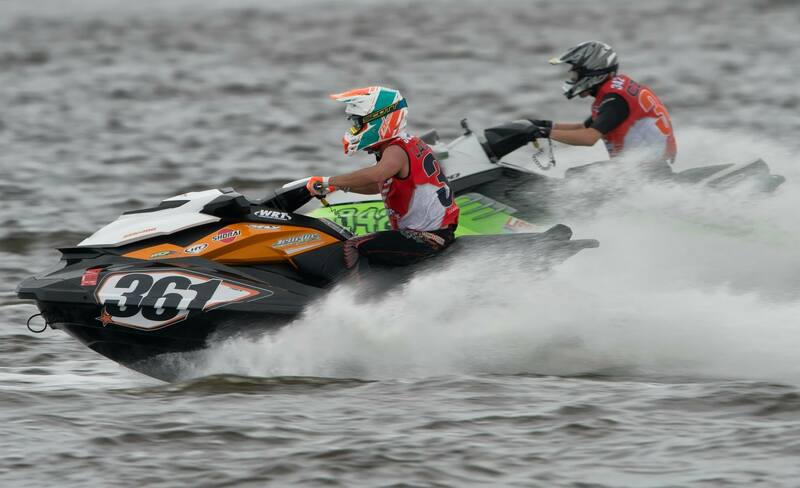 The P1 AQUAX racing series continues to grow in popularity as the second round of the US tour took center stage near downtown Jacksonville, Florida in front of an estimated 10,000 race fans over the weekend. 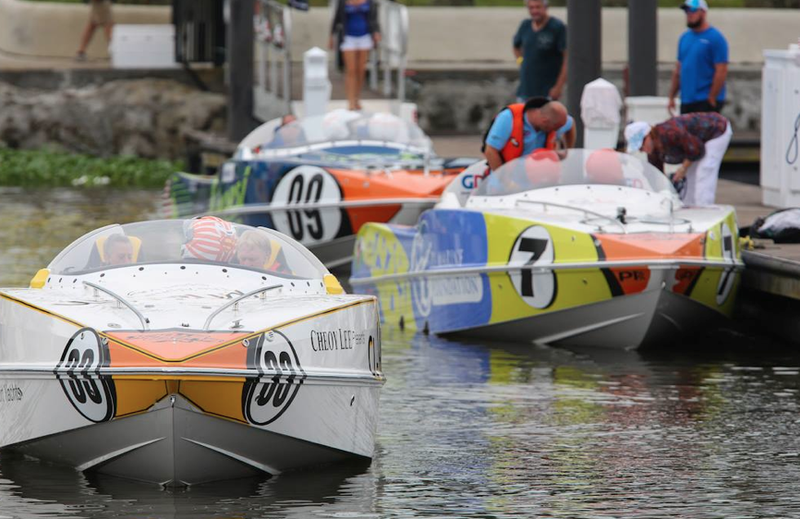 After the season opener in the surf of Daytona Beach in April the watercraft racers joined the Evinrude powered Superstock boats for a full throttle weekend of boating competition. 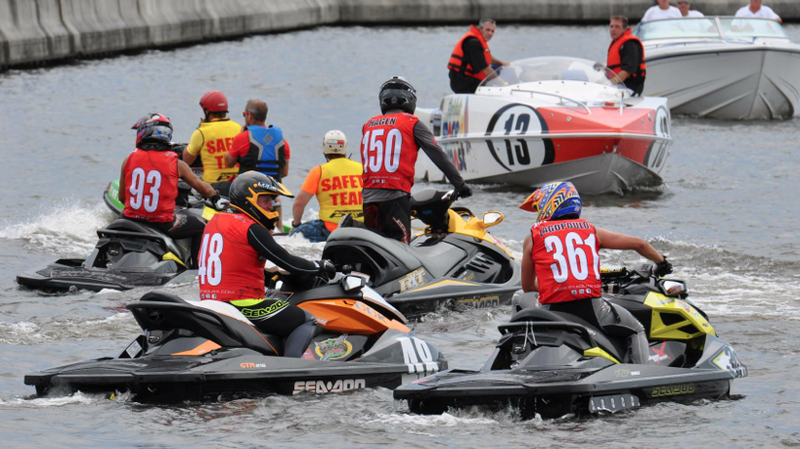 The large 1.8 mile track on the St. Johns River provided a good arena for close handlebar-to-handlbar action in a series where the competitors compete on nearly out-of-the-box stock watercraft that places more emphasis on rider ability and stamina than other forms of watercraft racing where modifications play a more significant role. 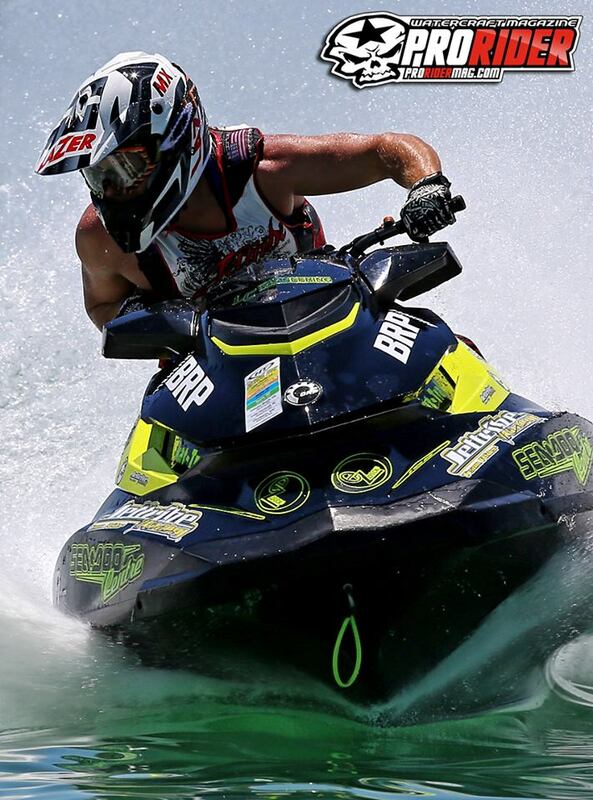 Sea-Doo racers have extra incentive for top finishes at the AQUAX races with extra prize money available to them through the Sea-Doo Bounty racer contingency program, the program that will reward Lagopoulos an extra $250 from BRP for his win. For more information on the Sea-Doo GTR 215 visit sea-doo.com and more information on the P1 AQUAX series visit their website or Facebook page.